The proper etiquette, or decorum, is key to ensuring a positive environment and good sportsmanship. Etiquette solves most issues before they ever arise. Each contestant is responsible to prepare one pit. Since both contestants must pitch on each pit, it is a good idea to do a good job preparing their respective pits. Before and after each game the contestants should shake hands. It is customary to offer an encouraging word before the game and congratulations to the winner afterward. When one contestant is pitching, the other contestant should remains quiet and still. Their position should be behind the pitching contestant on the opposite pitching platform. This not only ensures they are out of eye sight, but that they are also out of harm’s way of the swing horseshoe. If a contestant is being intentionally disruptive in attempt to harass their opponent the behavior should be stopped immediately. A pitcher should not feel intimidated to ask for help. After pitching, the contestants should walk to the pit together and decide on the score before any shoes are moved. If a contestant arrives before the other and picks up the horseshoes before their opponent has agreed to the score, the first contestant’s picked up shoes become foul and do not count. It is best to wait. Pitchers need to remember that they are not the only participants competing at a given time. The courts to the sides of their court may be occupied. They should stay out of their way and if they need to leave the pitching area, they should never pass in front of a pitching player or between the stakes. Instead they should leave behind a pit when the other contestants are pitching the opposite direction. The shorter distance pitchers that pitch at 30 feet should move behind the contestants on the nearby court, particularly if they are longer distance 40 foot pitchers, so their movements do not distract the other pitchers. 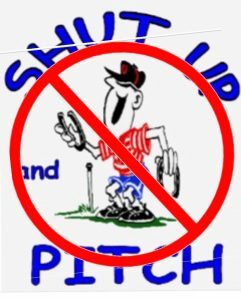 If a pitcher pitching first pitches a foul shoe, they should offer to go and remove it from the pit before the second pitcher pitches. The second pitcher may decide the foul shoe is not a bother to them and it can be left, otherwise it should be removed from the pit as it is no longer in play. Because horseshoes is a challenging sport, sometimes beginners who are still learning the fundamentals may get discouraged with a lack of scoring. Contestants should offer support and even a tip or two to encourage such a player. Not only does this help the game progress in a more enjoyable manner for both, but it builds friendships.